I love Easter..the bunnies, bright colors, spring dresses, the great weather here.. I love it ALL. Here are a few Goodwill transformations in my entryway right now. This is my bunny shelf I found for $3.00. 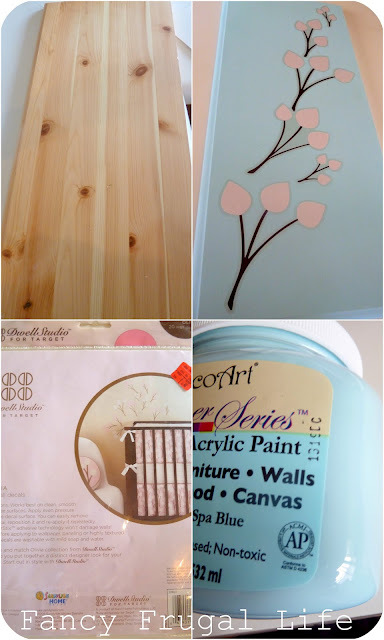 I sanded, primed, filled the holes with wood putty, and painted it Spa Blue (a paint from Hobby Lobby pictured below.) I love cherry blossoms so this paper, also from Hobby Lobby, is perfect for the sheves...I love that I can use him as a fab focal piece or maybe even serve some Easter cookies or treats from it. The next project is a beveled piece of wood from Goodwill ($2) that I primed & painted the same blue. I had a pack of these wall decals from Target left over from years ago that I saved from my daughter's nursery. (See it pays to hoard baby stuff sometimes :o) ) They happen to be cherry blossoms so I used those to turn it into a piece of wall art. I like that they are removable in case I want to do something different with that piece of wood later. 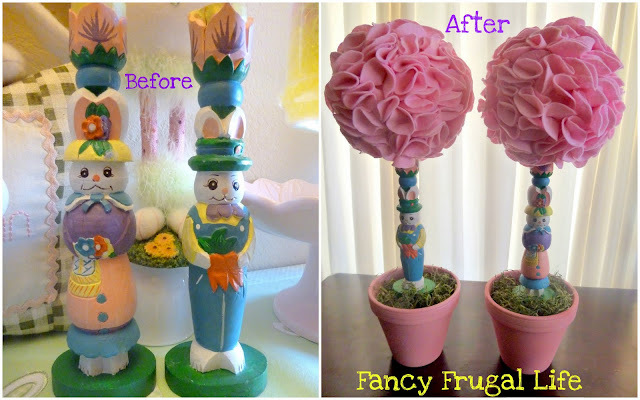 Finally, here are my Goodwill candlesticks turned Easter topiaries from last year. You can read about them here. Love these! They look so fab now! I wish I could spot these kind of finds at the Thrift Store better. I need to try going more often. The bunny shelf is my favorite! I'm trying to decorate a little for Easter this week. Thank you so much for stopping by The NY Melrose Family and leaving such a sweet comment about my Minnie Mouse Centerpieces. I love your site. 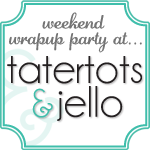 Congratulations on the feature over at Tatertots and Jello. I loved this post! They look fabulous! 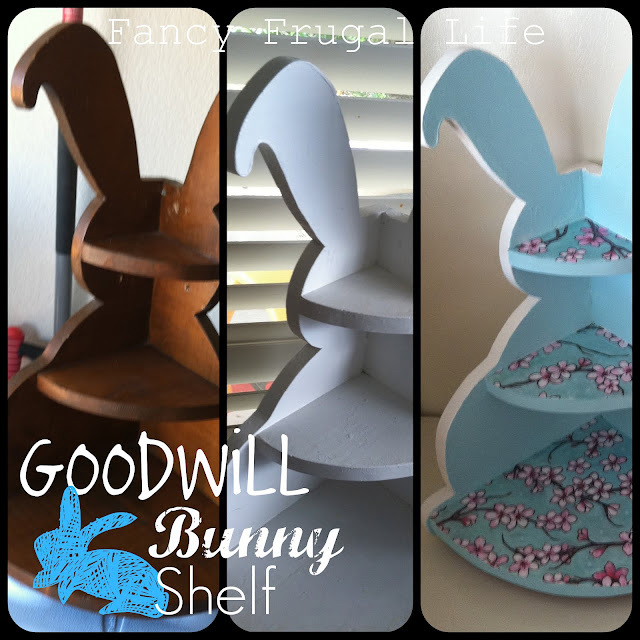 Especially love the bunny shelf..so cute! That's amazing! You did a great job! The muted blue with the cherry blossoms is lovely! 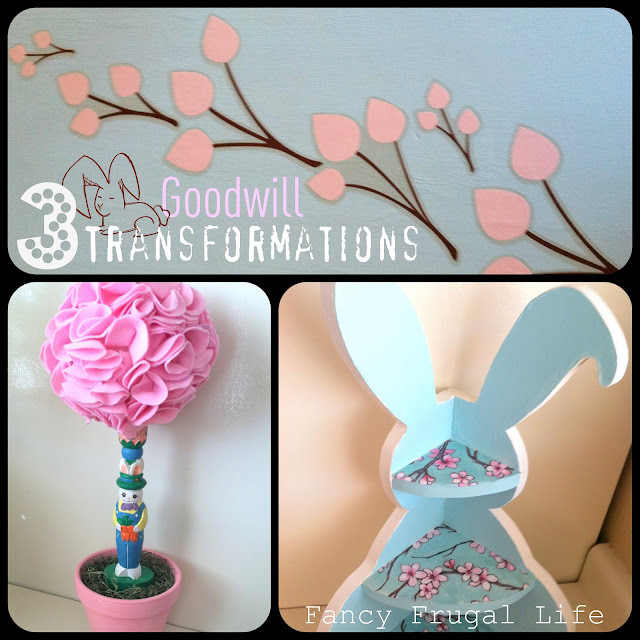 Great transformations! Gotta love the Goodwill!!! You did a great job! I love cherry blossom and of course I love your bunny shelf..
How adorable! I love your bunny shelf and topiaries! You're so creative! I'm your newest fan. 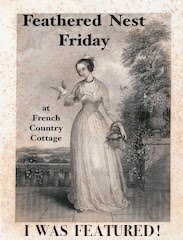 Please stop by bellanest.blogspot.com any time! That bunny shelf is so cute, I love how you re-did it!!!! So sweet!!!!! Great job--I love it that you are supporting a good cause, getting a great deal and using your diy skills all at the same time! Wow! You did a great job. 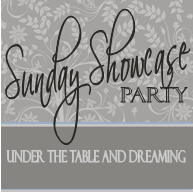 So glad you linked up, I think you are going to inspire a lot crafters. :) Samantha @ Cowgirl Up! I was at Good Will yesterday looking at Easter stuff and thinking "I KNOW someone in blog land can make something with this stuff". Now I know who! Very cute!! 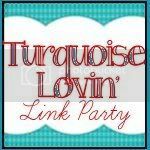 Thank you for linking up at Feathered Nest Friday!